2007 dream? encounter with this white-skinned, snake-eyed being. Illustration © 2010 by Canadian graphic artist experiencer. 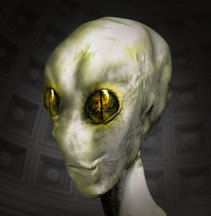 December 12, 2010 Albuquerque, New Mexico - On November 23, I reported news updates on Coast to Coast AM radio and at Earthfiles.com that included lights and “gyroscopes” of unknown origin over Isles of Capri, Florida, and a Texas nurse's face-too-face encounter with a lizard-skinned creature at her home. I received hundreds of emails from people describing similar sightings or encounters, including a TV and radio engineer who has worked on an American president's press conferences. The following headlines have hot links to the reported news followed by a few of the many emails I have received.